This international annual competition challenges students to solve big societal and environmental problems and awards $1 million to the winning team to bring their idea to life. As a designated Hult Prize Campus, students of all majors are invited to this workshop where organizers will review the challenge topic, facilitate team selection and conduct a design thinking workshop to get participants to start brainstorming solutions. This year’s challenge is identifying solutions for Youth Unemployment. This event is part of UO Startup Week and is sponsored by the UO University Innovation Fellows. 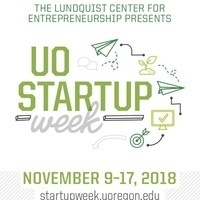 Startup Week is a week-long series of cross-campus events and activities that highlight entrepreneurship, startups, university commercialization and university spinouts at the University of Oregon. Students, faculty, staff and community members can learn how to get started with a for-profit or nonprofit idea, navigate the university and local resources available for launching and scaling a venture and meet others with shared entrepreneurial interests.